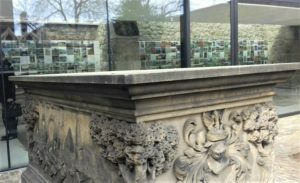 I had visited this small but lovely museum before its refurbishment and found it charming, especially the tombstones in the graveyard of St-Mary-at-Lambeth Church, where it is located. I returned last week. 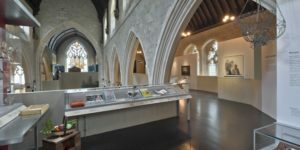 Formerly the Museum of Garden History, the museum underwent a major refurbishment and development between 2015 and 2017, which created a mezzanine level within the original church, opened up the medieval tower and created two new gardens. During that refurbishment the tombs of five former Archbishops of Canterbury were discovered, including that of Archbishop Bancroft who oversaw the translation of the Holy Bible for the newly crowned King James – that treasure of language the ‘King James Bible’. 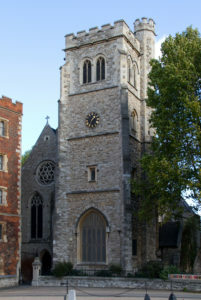 The location has been a site of Christian worship since Anglo-Saxon times, though the body of the existing church is a mixture of medieval (1337) and Victorian (1851). Archbishops aside, its most famous occupants are the entombed Johns Tradescant, father and son plant-hunters and Royal Gardeners of the seventeenth century, together with that of Admiral William ‘Bread fruit’ Bligh, of Bounty fame. The Tradescants’ Cabinet of Curiosities, described as ‘a world of wonders in one closet shut’ has been reproduced within St Mary’s as the Ark. Father and son visited three of the four continents then known, as well as the Arctic, in their search for plants, which they brought back to these shores. They also established a botanical garden at Lambeth near where St Marys stands. Tradescant senior appears as a character in Jeanette Winterson’s novel Sexing the Cherry (1989). One can now climb the tower, though beware, there are 131 steps and some are well-worn. 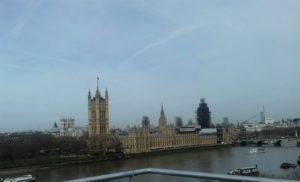 From its top there are excellent views over London. It is thought that Wenceslas Holler stood here to draw his famous 1647 Prospect of London and Westminster. The Museum, as well as being an archive and a learning space (complete with new café and shop) exhibits art, artefacts and gardening tools from Tudor times until the present day. The range is enormous, from fine art paintings and modern sculpture and embroidery, to ancient tools like the Tudor thumb pots and garden ornaments (including a gnome with fishing rod dating back to c.1900). The ongoing English relationship with gardening is well captured, from Tudor knot gardens through Dig For Victory to Gardeners Question Time and Gardeners World. 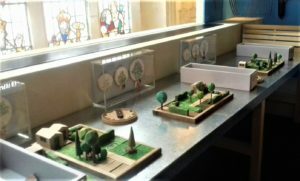 This visitor was especially impressed with the Robert Race boxes of carved wooden garden pieces – lawns, trees, borders, etc – allowing her a happy few minutes, creating a garden, lego-like. The embroidery frames were also clever. The new garden, designed by Dan Pearson, within a copper clad and glass modern building, elegantly incorporates the old graveyard, including the tombs of Bligh and the Tradescants. The latter has trees at its corners and its friezes show just some of their travels and discoveries. It is just feet away from busy Lambeth Road. The museum also houses temporary exhibitions. You don’t need to love gardening to visit this museum – there’s plenty of history and charm. The Garden Museum costs £10 to enter (concessions available) and is open seven days a week, though closed the first Monday in the month. This entry was posted in History, London, Nature Watch and tagged History, Nature, Worth a visit by juliej. Bookmark the permalink.